Jordan Brackett ’01 works to keep New Yorkers eating healthy. In his first year as an adviser to New York Mayor Michael Bloomberg on food policy, Jordan Brackett is already making headlines. The City’s health commissioner’s proposal that he helped craft to ban the purchase of sugar-sweetened drinks with city food stamps has drawn cheers from public health advocates, protests from soft-drink industry lobbyists, and a wide range of responses in newspaper editorials around the country. Supporters see a new opportunity in the war against obesity and diabetes. “Food stamps should provide nutrition,” Brackett says. “Soda not only doesn’t provide nutrition, it’s literally killing people and making them sick. Government shouldn’t subsidize that while trying to fight it with other programs.” Many opponents of the proposal, on the other hand, see it as an overreach of government regulation. 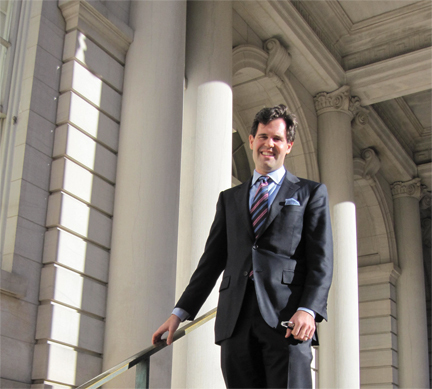 Whichever side you’re on, you can’t fault Brackett (pictured on the steps of City Hall in New York City) for being timid. 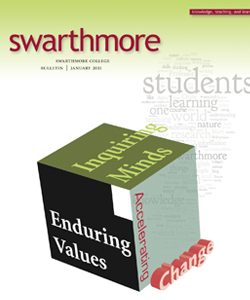 He credits his boldness to his own formative years at Swarthmore, where he twice served as student council president. In that role, Brackett worked closely with then-College President Al Bloom. Brackett took an inventory of his passions, and food and politics came out at the top of the list. 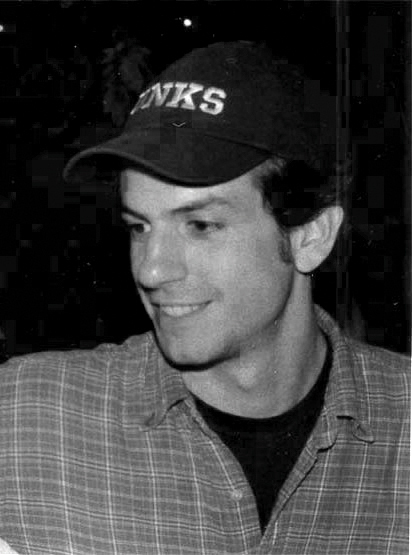 His break came when a mutual friend put him in touch with Ben Thomases ’97, the first food policy coordinator for the City of New York. Thomases was looking to hire a deputy and Brackett jumped at the opportunity. After Brackett began his new position, Thomases left City Hall to pursue an outstanding opportunity elsewhere. Although Brackett was sad to see Thomases leave, saying that he had done an extraordinary job, Brackett now had the chance to assume greater responsibility. In addition to the sugar-sweetened beverage proposal, Brackett also works on school-meal nutritional standards as well as incentives to encourage grocery stores to stay open in poorer neighborhoods. Not long after Brackett took the job, he was called in to brief his new boss, Linda Gibbs, the deputy mayor of Health and Human Services. He took a seat at a table in the Mayor’s famous “bullpen”—a collection of unassuming cubicles where the city’s most powerful government officials work side-by-side. As he chatted with Gibbs, Brackett looked up to see Bloomberg, the financial news billionaire and constant subject of presidential campaign rumors, pouring himself a cup of coffee just a few feet away. Once again, as at Swarthmore, the most powerful man in the room—in this case, one of the most powerful men in the world—was listening to his ideas. Mike Agresta is a Philadelphia-based writer. He has published in Boston Review, Texas Observer, Philadelphia Weekly, and various alumni magazines and literary journals. Clients include major universities and nonprofit organizations. Agresta has an M.F.A. from the University of Texas–Austin and a B.A. from Columbia University.